Innovative ship propulsion and design: paving the road to zero emission shipping. On the 11th of January 2019, the annual Conoship New Year’s reception took place in MartiniPlaza in Groningen. More than 200 guests attended the successful reception with this year’s theme: Innovative ship propulsion and design: paving the road to zero emission shipping presented in four presentations about different innovations contributing to the reduction of the ecological footprint in shipping. The four areas of discussion were: Carbon Capture (CO2AST), Wind, Hydrogen and LNG. Further information regarding each one of these projects and their speakers is given below. Conoship International was excited to host the New Year’s reception 2019 that was supported by Marigreen and in close cooperation with-Mariko, FME and the Netherlands Maritime Technology (NMT). We are thankful that there was such an interest in the innovative topics. We conclude that this year we reached the next level in reducing the ecological footprint in the shipping industry. Conoship International wishes a successful 2019 to everyone that attended the event and to the ones that were not able to come. And do not forget that together we can do more! The moderator during the event was Bas Ort, Chairman of the NMT, who succeeded in capturing the attention of the audience during the four pitches. Before the start of all four pitches, Jan Jaap Nieuwenhuis gave an inspiring opening speech about the changes in the world concerning the awareness of the changes in environment starting at the schools of today’s generation. He also thanked MariGreen for the cooperation in organizing this New Year’s reception and on their success in research in GreenShipping technologies. He introduced Ilona Heijen, the new head of INTERREG at the Ems Dollard Region that supports the MariGreen projects. Ilona gave a great speech (in Dutch and German) about the things that she see’s happening when working together with the MariGreen projects as an inspiring example. The first pitch revolted around the subject of Carbon Capture (CO2AST) and was discussed by Jeanine Klinkenbijl, ZEM Projects. She explained that the project was developed in a joint venture between German, Dutch companies and knowledge institutes. The technology consists of absorbing CO2 and then liquefying and storing it on board. The liquid can then be transshipped in the port and sold to potential end users. This technology would be implemented for the first time worldwide. The second pitch about WIND was discussed by Michael Vahs, professor at the Hochschule Emden/Leer. He talked about the vessel of the future making use of wind propulsion. The vessel he showed was equipped with one Flettner rotor, one eConowind-unit and a version of wind assisted propulsion that represented a combination of both technologies. The third pitch about Hydrogen was discussed by Arjen Mintjes, teacher at the Maritieme Academie Harlingen. He shared that after emission limits for CO2, HC and NOx are tightened in the last years, this trend is expected to continue. In order to comply with the new standards, alternative propulsions systems as well as fuels should be considered. From this point of view, hydrogen is very promising, because it allows for a significant reduction of emissions. And last but not least the pitch about LNG was discussed by Leo van der Burg from FME. 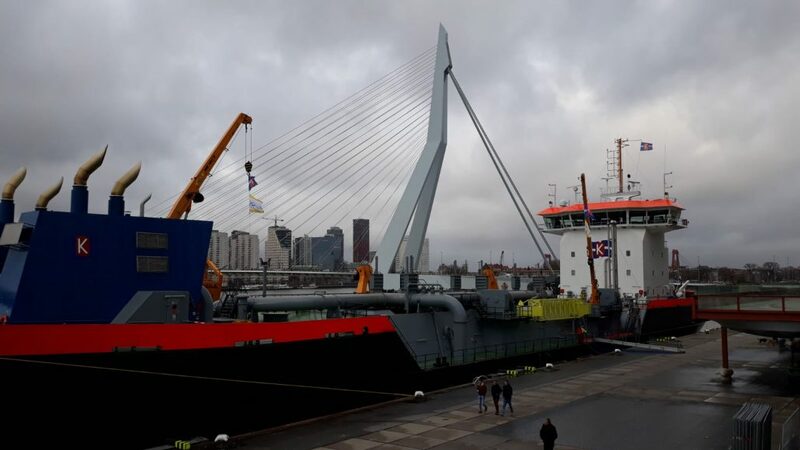 He was a great substitute for Guus van der Bles who couldn’t be there in time because he had to be in Rotterdam for the Christening from the Ecodelta, a Conoship International designed trailing suction hopper dredger on LNG. Leo explained that one way to meet stricter environmental requirements in shipping, but also in other segments of the transport and energy supply sector, is the use of natural gas. LNG (Liquified Natural Gas) is natural gas that is brought to a liquid state by cooling to a temperature of about -162 ° C.
After the pitches everyone could visit the stands and get inspired or share their ideas and knowledge. All together it was a great start of the year. In 2015, the project Ecodelta was initiated by Van der Kamp, a Zwolle-based dredging company and Conoship International. Ecodelta is a trailing suction hopper dredger which consumes liquified natural gas (LNG). This one of a kind dredger has two main objectives: recover valuable material from the seabed and create a greater depth of water. The vessel has a length over all of 134.10m, the breadth moulded 21.40m, a dredging draught of 7,770m, a hopper volume of 5900m3, a dredging depth below baseline of 35m and a Gross tonnage of 7560 GT. The ship has been designed by Conoship International and has been built by the Frisian shipyard Barkmeijer. Today, January 11th, the vessel will be christened. Conoship International congratulates Van der Kamp with reaching this milestone and thanks them for the pleasant cooperation throughout the project. Conoship International is very proud of the result and wishes the Ecodelta and her crew many safe journeys.